NOTE: I’ve updated this article from the original that I published on HammockForums.net in 2010. Along with “Hike Your Own Hike,” it’s equally important to “Pick Your Own Pitch” and “Choose Your Own Tarp.” Just as there are as many hammock options to choose from, there are equally as many tarp configurations and rigging options to match. This is good news, really, because it means you can customize your shelter system to match conditions. I have several tarps to pick from depending on my trip type: lightweight, winter camping, super coverage, etc. When it comes to tarps, some prefer full coverage while others get skimpy. There’s no right or wrong answer here, and your choice depends on many factors: weight, coverage, versatility, durability, etc. And while there are tarps designed specifically for hammocks, nearly any tarp will work so long as it provides the coverage you are looking for. It is generally agreed that full-coverage tarps, or “winter” tarps are best for four-season camping when you need maximum protection from the elements. Winter tarps usually add extra flaps or “doors” to the ends of the tarp that can be folded inward to enclose all four sides. Some manufacturers sell “doors” as an optional add-on to common hex or cat-cut tarps (a common add-on door is called the Grizz Beak). Large tarps also provide good privacy for modesty when changing clothes, etc. There are some trade-offs with large tarps. Big tarps with extra tie-outs provide a lot of versatility and pitching options. And while you get extra coverage and protection from the elements, it can take some practice to master the pitching teqniques to get the most out of these shelters. Large tarps typically weigh more and can require extra hardware (e.g., stakes, guylines). In moderate conditions, almost any tarp can be modified for good coverage, ventilation, and privacy. Some users have successfully used ponchos as dual-purpose a-sym tarps. Diamond tarps offer more coverage than a-sym design and are equally simple to pitch. Keep in mind, however, that smaller tarps require greater skill to keep dry in adverse conditions. It is often necessary to sleep in a specific direction under an a-sym tarp to maximize coverage. What Size? Regardless of what style tarp you choose, you want to ensure the tarp extends between 6 to 12 in. (15 to 30 cm) over each end of your hammock. An 8×10 ft (2.4×3 m) tarp turned ~39° to be an asym tarp provides a ridge line of nearly 13 ft (4 m). This would provide ample coverage for nearly any hammock. Remember that a hammock sags when properly hung so a 10 ft (3 m) long hammock will have a peak-to-peak length of just over 8 ft (2.4 m). One great advantage of hammock camping with tarps is that in adverse conditions—rain, snow, wind—you can set up the tarp first and then keep your gear dry as you set up the hammock and sleep system. Most ridge lines fall under one of two categories: end-only or full-length. End-only lines essentially eliminate the rope between the tarp tie-outs, which can reduce some weight. Full-length ridgelines run the entire length of the tarp and can be used under the tarp or over the tarp. With a full-length ridgeline, you can set the line first and then adjust the tarp along the line to center it. It is often easier to center a tarp between the supports with a full-length ridgeline than with end-only lines. Hanging the tarp over a full-length ridgeline provides additional structure and can be preferred during extreme conditions when the ridgeline can help support extra weight, such as during a snow storm. With the ridgeline running under the tarp, it also provides handy points for clipping gear to air dry, or to attach a bug net. Whether you use a full or end-only ridge lines, one method for attaching the line to the support is to create a “V” around the post (see illustration). Essentially, you begin to loop the line around the support starting at the end point of the tarp. You then take the line around the support and then attach the line back at the beak of tarp. This creates a space so the hammock suspension can swing with less collisions against the tarp suspension line. Once the ridge of the tarp is set, you can set the guy lines. 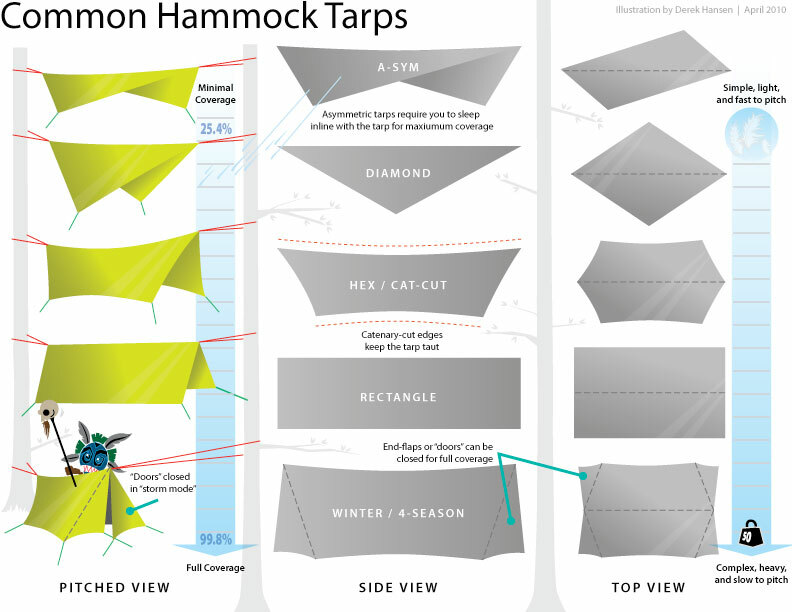 Diamond or asymmetric tarps have as little as two guy points, so set-up can be quicker. Guy lines of approximately 6 ft (1.8 m) allow enough length so you can guy the tarp around other nearby supports or to a stake in the ground. Pitch the tarp low during adverse conditions. Pull the tarp out and open, even using trekking poles or sticks to open the tarp for more ventilation or views. You can also guy down one side of a tarp to protect from wind and rain and open the other side in “porch mode,” depending on conditions. Many tarps (e.g., those made with nylon) stretch during the night, so even the tightest pitch before going to bed may slacken by morning. You can retrofit guylines with elastic shock cord or purchase them ready-made from several manufacturers. With shock cord on the guy line, the tarp will remain taut as the tarp stretches. So I am seriously considering going all hammock! I only did my first backpacking trip this weekend. My buddy (also his first trip) had a hammock. I am also working to develop my rig as a light weight (not ready for ultralight) setup. So probably trying to get too much out of my equipment, but I was hoping to get a hammock I could use my exped pad in and hold off on an under quilt for now. My tarp needs replaced anyways but the Grand trunk funky forest tarp seems too heavy (essentially my hammock setup replaces a light weight tent or tarp setup) but cuben fiber hex tarp is too expensive. Is there a Hex/ Cat-Cut that is light and not so expensive that would work for light weight and hammock to ground transition if needed? I purchased you book this week but have so many questions didn’t want to wait the few days extra to start researching the setup. Welcome to the light side, Alan! Have you read my à la carte post? There’s a lot of great info there and lists on available tarps and hammocks that may serve you. The best hammocks that work with pads are those with two layers or sleeves. The bridge hammocks are the best for pads because they conform well to the pad. Gathered-end hammocks tend to twist the pad like the rifling effect of a gun barrel. Hennessy Hammock sells some inexpensive hammock tarps that you may fit your budget. I’d go with a hex tarp for all-around utility. Thanks Derek! Your book came today..already read once through! I had heard about the double layer hammocks to use with pads and realize it isn’t the most ideal, just trying to get the most (maybe too much) out of my gear. I’ll check in to it. The light side tends to get expensive fast yes? 🙂 Trying to choose gear wisely and not buy things I’ll want to replace later but that may be unavoidable on some level. Love the site and the book. I’ll check out the a la carte post now that I have a bit more understanding of the options. Thanks! I’m trying this with my new Brazilian woven cotton hammock( bed size 98.5″ x 59″) on top & my old older less wide cloth hammock underneath with a 7-1/2 foot long piece of 24″ wide Reflectix sandwiched between. It will only drop to the mid 50’sF but quite a change from 81F last night. If the 2 part system works an old sleeping bag could sandwiched there for colder temps. thanks for the 2 part suggestion as trying to keep a pad underneath me is a struggle. Awesome Guide. Thanks Derek. Made it easy for me to go for a Hex tarp. As of now I’m using a Diamond tarp from Claytor for most of my hangs and borrowing my girlfriends Big Rain Fly also from Claytor for winterhanging or when I need more cover. I also use a full length Ridgeline underneath for strength in hard winds and to dry clothes. For guylines I use the fail safe rubber bant tarp line tensioners, only made of elastic cord. Also I’ve sewn in bits of reflectic material to the edges of the tarp to be able to find it if it’s pitch black in the night. The Diamond is great for weight but sometimes provides little cover at the gatherings of the hammock and the big winter tarp is great for coverage, but is a bit heavy to drag along on long steap trips, so I would like to go with a hex, preferably something like the Black Cat tarp. In my experience dark colors will let you sleep longer in the mornin sun. Also i use guy line tensioners like these: http://www.rvops.co.uk/imagecache/d7a420ca-f912-4b4b-9d87-a0c20107125c_603x510.jpg (I had to reverse them to get them to do what i want them to do) to adjust the length of my guylines in a hurry. No mention to the water resistance for these tarps. What is adequate (1000mm)? or a higher rating? All the discussion is on the shape and rigging style and nothing on the water resistance which is the most important part of choosing a tarp, to keep dry. Good question. I’ll look into that. Thank you lots for all the great advice on this website. I’m looking for a no-fuss (ie. structurally sound) tarp that is able to take torrents (summertime in the Alps:)) and these on photo 6 and 8 caught my eye. Would you mind sharing the model name(s) please. I can’t quite distinguish if it’s the same tarp in 2 setups, but what I do see is that it’s quite an awesome one. Care to share the experience? If I’m matching the right photos, they are both different makes but both are hex designs. One is an OES MacCat standard and the other is the Hennessy Hex tarp. There are many companies who sell hex tarps, including Warbonnet and wilderness logics. I use an ENO Doublenest with a Warbonnet Superfly….great combination. Hennessy hammock. Grand trunk. Warbonnet. Ticket to the moon. Wilderness logics. Arrowhead equipment. Outdoor equipment supplier. Underground Equipment. Hammock Gear. KAMMOK. Eagles nest outfitters. Hammock bliss. Jacks R Better. Who did I miss? I use a 12×9 tarp from walmart was about 12$ works great and goes all the way to the ground. I havent figured out why people leave there cover so far from the ground as the point is to stay dry guess everyone likes getting there feet wet. Me on the other hand like to keep myself and my gear dry hense the reason my tarp goes all the way to the ground it is light weight and very effective. Just my opinion. Derek, in the section “ridge lines” I detected a little mistake. You wrote “With the ridgeline running under the hammock, it also provides handy points for clipping gear to air dry, or to attach a bug net.” I’m sure you mean “under the tarp”. I read it as being under the hammock straps, since mention of the tarp line being attached to the tree under the hammock straps. I know, last post. Here are my 2 cents. HH with self inflating pad and poncho liner in the winter along with a mylar insulting pad used for pipes,I slept well in to the teens. Along with my Kelty bag of course. The a-sym tarp that came with the Hennessy provides good coverage from rain, snow and wind. Experimenting with Aqua Quest sil tarp for extended coverage. Derek, thanks for all the great info over my past 2 years as a hanger. Great article! After much evaluation I made my first tarp the Wilderness Logistics Big Daddy hex tarp with side panel pulls and an extra tie-out on the bottom of each side for more versatile pitching options. Any recommended guy line lengths for side and corners? I have read about 3 feet for the corners but don’t want to waste rope trying to figure it out. Any guidance or resource would be greatly appreciated. Cheers! ~Tommy. I like long guy line because I’m often using other trees or branches to tie off and the extra length is nice. I also camp in rocky areas where instead of stakes I wrap the line around rocks. I also don’t invest in expensive guy line. I don’t think it’s worth it. It’s something I know gets a lot of abuse. I buy a spool of #18 braided nylon mason line. It’s strong and light and cheap. I actually have line that has lasted many years. Derek would you kindly share a little more about winter tarp guying of doors? I see the drawings but need a little more walk through please. Are you talking about using a large rectangular tarp and modifying it by pulling in the ends to create makeshift doors? with the exception of the 4 season tarp, how do these tarps deal with sideways rain (something I see unfortunately often)? Site selection is my usual course of action, but you can’t always choose your ideal spot. If you choose a minimal tarp (diamond or asym), you can use a storm pitch, by bringing the sides down at a steeper angle, and then augment the protection with a weather shield. I like the cover from Therm-a-Rest as it also has an aluminized inner, helping to reflect some heat back to the hanger. I’ve always been hesitant to use my hammock overnight. I think i’ll try it out now. There’s some really good info here and I’ll need to start looking into which tarp I want. I don`t completely understand, can it be used if outside is raining? Or default tent is better? Hi Derek, I noticed that the standard length of the tarp ridge line that people choose is 11 feet. Wherever I go, I hear people recommending 11 feet. I’m planing to buy the tarp with doors from Hammock Gear, and I thought that 10 feet might be a great idea to shave off a few grams, because, considering what you wrote, a 3 meter hammock sags and is just over 8 ft. So wouldn’t buying a 10 feet tarp make more sense? If you still have around 30 cm to spare? What’s your take? Yes that’s possible. I often hang with tarps that small. Just note that you’re at a minimum clearance. Use the Hang calculator to verify. I sort of chuckle at these OCD gram counters. A 1st class letter(up to 1 ounce) can travel can travel for 49 cents. That 1 ounce equates to 28.35 grams. I’m fairly sensitive to weights but can I detect a 1 ounce discrepancy in a pack weight of 10 pounds?